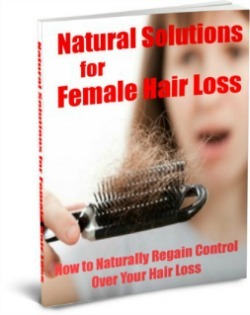 Do You Have PCOS Because of Chemical Pollution? Have you noticed how difficult it is to get rid of polycystic ovary syndrome symptoms, like weight or infertility -- even though you've done all the "right things"? 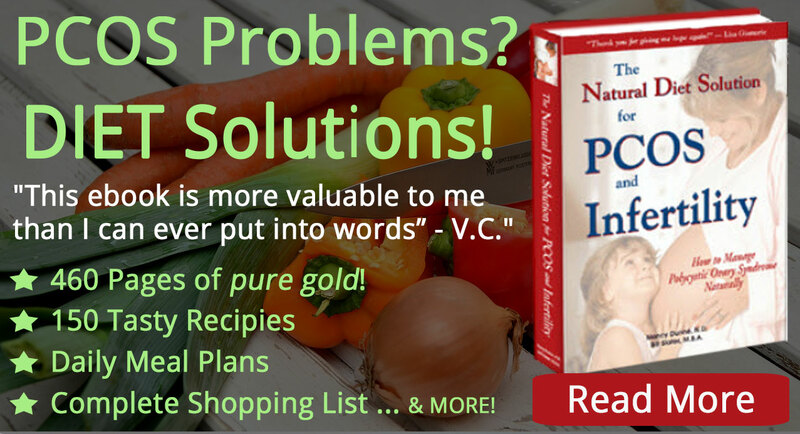 You've followed a healthy diet like the one in The Natural Diet Solution for PCOS and Infertility e-book. You've increased your exercise. 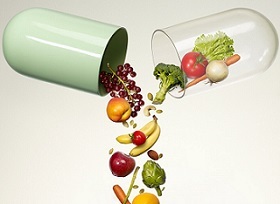 You take nutritional supplements. You're controlling your stress level. You've even resorted to pharmaceuticals to get some relief. And yet, PCOS just keeps hanging on. 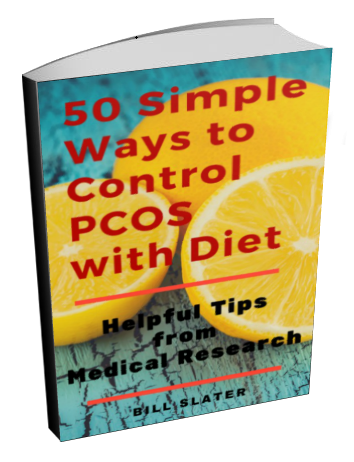 Your doctor probably told you that your PCOS is caused by "insulin resistance", or the inability to efficiently utilize the insulin hormone -- which causes a more generalized hormonal imbalance. But do you ever wonder what causes the insulin resistance in the first place? We all know by now that insulin resistance can be profoundly influenced by what you eat and how much you exercise. If so, what could be the reason why you still have trouble with polycystic ovary syndrome and hormones in spite of good diet and exercise? In an attempt to find out, we need to go back in time -- back to your childhood -- and even further back, all the way back to when you were in your mother's womb. What we'll talk about today is something called "fetal programming", or how the fetus is developed. You can imagine this developmental process as similar to creating a computer that has both hardware and software. The genes provided by the mother and father are the "hardware". Other factors in the maternal environment are the "software" that causes the hardware to behave in a certain way. The software consists of "eipgenes", which modify the behavior of genes. For example, let's suppose you install Angry Birds on your iPhone. You will get the Angry Birds game, right? But what if you install a Scrabble app instead? You will get a Scrabble game. The hardware in the iPhone is the same but you get a different result, depending on which app you install. The same is true for epigenetic factors. An epigenetic factor is anything in the fetal environment. For example, if the mother is starving, the fetal programming is altered. If the mother is a smoker or exposed to a toxic metal like lead, fetal programming is altered. If any of the mother's hormone levels are way too high or way too low, fetal programming is altered. If a mother eats only cookies and ice cream, fetal programming is altered. And so on. Here's the catch. A smart phone app can be completely uninstalled. But in most cases, fetal programming cannot be uninstalled or only be partially uninstalled. So it's quite important that fetal programming not get messed up. The fetal programming that occurred while you were in your mother's womb has a lot to do with why you have PCOS today. Fetal programming will also deeply affect the future health of your unborn child. Are you still with me? 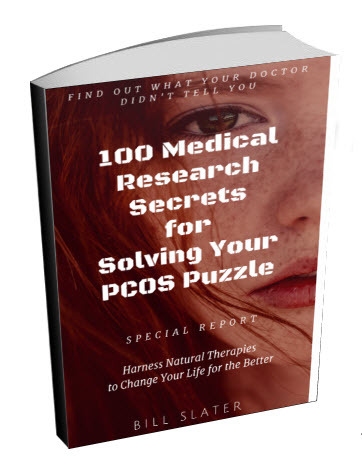 We are beginning to look at the hidden roots of what caused your PCOS and how your future children will be affected. It's a little depressing but we need to dig into murky, dark areas to find answers to PCOS and infertility. Isn't it better to live in reality rather than bury our heads in the sand? One of the biggest -- and most invisible -- factors causing altered fetal programming and development is the presence of gigantic, incalculable amounts of man-made environmental chemicals. After looking at dozens and dozens of research articles, it appears to me that these chemicals are a dominant threat to our health and our future -- and they can seriously alter fetal programming. To be quite frank, I am appalled by this research. Collectively and individually, we must immediately come to grips with this threat. I don't see how PCOS can go away until we have this issue handled. However, it's complicated. We'll explore the relationship between PCOS and chemicals in greater depth another time. For now, take a look at the diagram below. 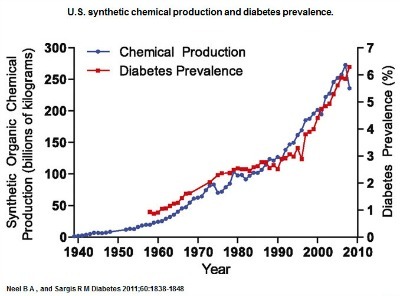 It shows a very tight correlation between chemical production and diabetes over the past 50 years. Is this just a coincidence, or is something going on? We'll answer that question next time. (By the way, the graph below is relevant to PCOS since both PCOS and diabetes are thought to be caused by insulin resistance). I'd like to think that this increase in diabetes is because we're eating a lot more food these days. While that's true, diet alone cannot fully account for such a rapid and dramatic increase. Are Environmental Chemicals a Health Menace? This article is simply to alert you that environmental chemical pollution is a threat to you, your children, and your future children. 1) The research data suggests a "greater role for EDCs in disease, even more than was predicted just 10 years ago. Taking the animal and human evidence together, the report demonstrates a strong likelihood that exposure to EDCs during fetal life and/or puberty plays a role in the proliferation of male and female reproductive problems, endocrine-related cancers, infections, asthma, obesity, diabetes, and behavioral and learning disorders, including attention deficit/hyperactivity disorder (ADHD)." 2) "The incidences of these conditions have increased significantly not only in the United States but across the globe. Because genes do not change fast enough to explain this increase, environmental causes must be involved. The environmental contribution to disease is estimated to be 24?33% of the global disease burden." 3) "It is now accepted that development (in utero and the first years of life) is a very sensitive time for EDC-induced health effects." 4) "Identifying those chemicals with endocrine activity from all the chemicals used and released worldwide is a major challenge, and we are likely assessing only the 'tip of the iceberg.' Hundreds of chemicals, as well as persistent organic pollutants, have been identified as EDCs." 5) "EDCs likely affect all hormonal systems that control the development and function of reproductive organs, regulation of metabolism, and satiety. Recent research has shown that EDCs also affect physiological systems that control fat development, weight gain, and glucose levels." 6) "EDCs have contaminated the world via the natural flow of air and water. Several hundred EDCs have been measured in humans and wildlife, even in remote places such as the Arctic. Thus, it is now impossible to examine an unexposed population anywhere on Earth." Nearly all of the research we've seen agrees with this World Health Organization report. So each of us has some serious work to do to reduce this menace to our health -- and prevent PCOS from passing through to future generations. Don't wait until the next newsletter arrives. Here are 4 things you can do right now to start reducing your chemical burden. 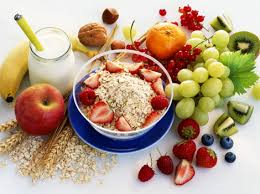 1) Eat organic produce and organic animal products as much as possible. 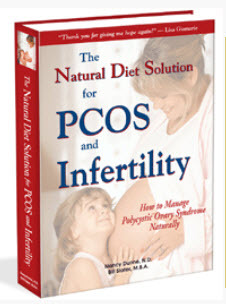 2) Switch from processed foods to whole foods, as described in The Natural Diet Solution for PCOS and Infertility e-book. Processed foods contain chemicals and other substances that can increase pregnancy complications as well as harm your health. 3) Keep your house free of dust, especially if you have young children. Dust is a repository for chemical pollution. 4) Examine your household products to see if they contain chemicals that you don't understand. Is the product something you can do without? Can it be replaced with something natural? Take triclosan for example, which is an antibacterial and antifungal agent. Its molecular structure is similar to a thyroid hormone. Medical studies are suggesting that it might disrupt thyroid hormone function, possibly resulting in fetal development and fertility problems. No one knows for sure. By itself, maybe it's not too bad. But when you add it in with the hundreds of other chemicals you're exposed to, the total effect can be very damaging. P.S. There's no need to freak out over this and turn your life upside down. Just do what you can to reduce your exposure to environmental chemicals that disrupt your hormones and damage your health. 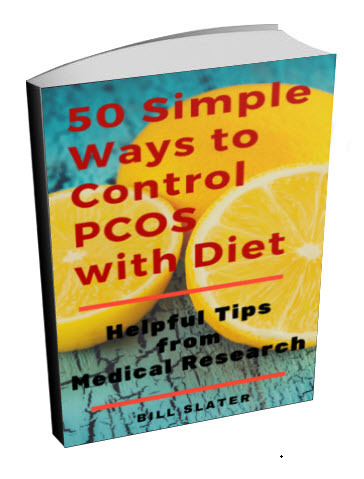 By doing so, you may be able to reduce your PCOS symptoms. Birnbaum L, State of the Science of Endocrine Disruptors, Environ Health Perspect. 2013 April; 121(4): a107. Rodríguez PE et al, Maternal exposure to triclosan impairs thyroid homeostasis and female pubertal development in Wistar rat offspring.J Toxicol Environ Health A. 2010;73(24):1678-88.